The first thought that came to my mind after migrating physical servers to virtual infrastructure was what to do with with the backup. Depending on your infrastructure you could already use a reliable backup solution. The major difference between using backup for physical servers and backup optimized for virtual infrastructure is the way back up is done. Physical backup uses an agent which creates a snapshot. The backup agent uses a snapshot to store it in its backup repository. Backup optimized for Virtual infrastructure uses a Hypervisor API to backup a virtual machine. By using an API, there is much less stress on the virtual infrastructure, and backup can use all of its benefits, making a backup fast and efficient process. If you are looking for a free backup for Hyper-V and VMware, there are several solutions. Most are limited in functions, but for smaller environments, they can do wonders. If you are using a free VMware hypervisor, you should know that it comes with backup API disabled, meaning that backup will have to use old, agent-based backup. Is there a free backup for VMware? Is there a free backup for Hyper-V? What is the best free backup for Hyper-v and VMware? I think there are many and I believe that you can find a product which you can use to easily backup your Virtual Machines using examples below. The latest version has improved Synology support, AWS backup support. From version 7, it also supports Hyper-V. I see Nakivo success stories all around the internet. With the latest update, you can automate and orchestrate a disaster recovery which is a feature which is usually sold as a standalone product (very expensive). By the way, Nakivo is one of my favorite backup solutions for AWS, VMware and Hyper-V. It will impress you with very affordable price and features that can match the Titans. It features deduplication across the entire repository, not only per backup job meaning that it will save you a lot of space. With the latest version, it has matured to the enterprise level, support for EMC Data Domain Boost and features like DR Orchestration are now included without additional fees. Backup copy, including a backup copy to Amazon cloud! You can Install it on Asustor, WD, QNAP, Netgear and Synology NAS. Full VM restore in case you have to restore a complete VM. The free edition is limited is free and it includes the license for 2VMs, which you can easily upgrade to the paid edition. All in all, Nakivo Free backup looks like a great solution for backing up ESXi and Hyper-V.
Altaro has a great backup product for VMware and Hyper-V. The main product is called Altaro VM backup and comes in two commercial editions. In order to give back to a community, they decided to offer a free product. The free version is limited to two virtual machines. Backup features you will love support for Hot and Live backups. The full version is one of the least expensive backup solutions, and you can read Altaro Hyper-V backup review before installing it. Even though Altaro VM Backup is a free version, it uses compression and reverse delta for backup. Altaro free backup is quite capable if you use only 2 VMs. It’s one of the best free WMware and hyper-v backup solutions making it great for small servers and branch offices. Unitrends, once the rising star, really disturbed backup scene when they decide to notify the world about them. Not only because they had a great free backup product which was limited only by the amount of VMs you could back up but also because they announced to support a free product which can backup free VMware ESXi version. It was the most feature complete free backup on the market. It had support for Vmware and Hyper-V. I don’t know what the reason they removed the free backup from Arsenal was, but perhaps it was related to financial problems or a bad decision from the management. There is still a way to get Unitrends backup free edition. There are two versions. Unitrends Free version (VMworld edition) is limited to a VMware – free edition. Unitrends Free version (this is the one you’ll want) has been discontinued for the public. It’s still available to members of Spiceworks community. If you are not yet a member of Spiceworks, hurry and register before Unitrends changes their mind. Once a great company with visionary people, great leaders, a voice that trembled and was heard across the community is turning into something. What, we will see. Trilead Explorer version 5 was one of the biggest surprises of the last year. I love how they transformed classic, windows based GUI to a modern web-based interface. Trilead is one of the cheapest Backup solutions for both, Hyper-V and VMware. One installation which can backup the unlimited number of virtual machines, can backup an unlimited number of hosts can be bought for $760. Regardless of affordable pricing, Trilead also provides a free version of Trilead explorer. A schedule is not is not included in the free version, however. Vembu brand is not very known in the backup space. 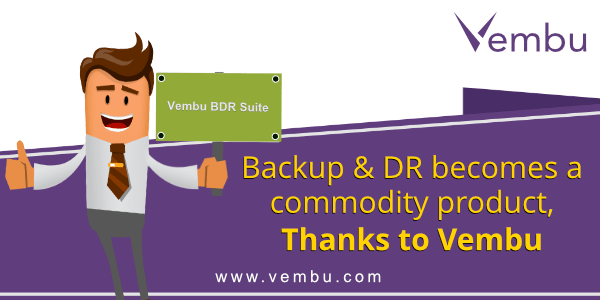 Recently they released a free version of Vembu BDR Suite. One of the strengths of the Vembu backup is that they have a complete backup suite and support from virtual to physical. They also feature backup for Windows Server and Windows workstations. Besides, for each product version, they also provide a free version – good job guys. Vembu backup comes with a 30 days full functionality version. After trial expiration, you can choose to upgrade to a full version or select a free version. If you are interested in the limitation of the free version, you can find the comparison here. You can download Vembu Backup Free from the Vembu Free edition website. Arkeia Software was a company which had some amazing products. In 2009 they acquired IP from Kadena systems where they received deduplication technology which later evolved in products that were pitched against EMC Avamar. The company has a history of free editions of commercial backup software. Arkeia was acquired by hard drive manufacturer giant Western Digital to expand its portfolio of software and services. Once you register, you will receive a perpetual license for virtual appliance free edition. Thinware backup started off as a beta product available for the public. First, they released a basic product and slowly added features. Thinware backup is the cheapest backup available for VMware. Starting at $149 per host for Advanced version, Price for the Professional version which includes all the functionality is $249 per host. They also offer a standard version which is free. While you can schedule backup jobs with Thinware standard, you are limited by unavailable basic compression. You can backup thin provision disks but you can’t backup thick provisioned disks. In the end, you can use it as a backup if your virtual machines meet disk provisioned feature and you should dedicate a bit more space for your backups. If you need a professional version, you can upgrade relatively cheaply. XSI Backup is an Opensource project created by the company called 33HOPS. That means that it’s completely free to use. If you want, you can even join development. XSI backup runs directly in hypervisor host. You don’t need any installed in virtual machines. XSI backup supports ESXi 5.1 and ESXi 5.5. It also works with the free ESXi version. You can program it via Cron. Gheto.sh is a set of powerful scripts which can backup ESX/i servers for free. The solution is difficult to implement and requires a good knowledge of VMware internals as well as Linux command line. The script takes snapshots of running virtual machines and backs the master VMDKs. When a completed snapshot is deleted until the next backup takes place. Scripts are compatible with ESX 3.5-5.x. Because it’s not utilizing VCB Proxy service, host server resources are utilized. There is also a front end called MKSBackup which can be used for scheduling backup via Gheto.sh scripts. 5 Nine Cloud backup is a fast, easy to use backup solution for Hyper-V. It was designed especially for Hyper-V private clouds. It does replication as well as a backup. It also runs on free versions, and it includes the Centralized backup console, even on free edition. It supports up to 16 node Hyper-V clusters with the free license. Limitation of the free edition is that it’s limited to the sequential backup and restore of virtual machines and it also doesn’t offer access to an API. If you wondered how you could easily backup your virtual machines using free products, I hope this list gave you some idea about alternative free backup software. While most of the products are limited compared to their commercial siblings, you can have a solid backup for VMware and Hyper-V for free if you have a small virtual environment. If you are IT professional, there is also an option to request NFR (not for resale) license. You should know that only the best companies offer this type of license. When choosing a backup provider, you should use only the best. If you are looking to obtain NFR license from Veeam, the procedure is fairly simple. Because they are a good company with a great product and great people. This is an excerpt from the Spiceworks community discussion about free products. When Kirsten was faced with an awkward question, she responded like a true Queen. 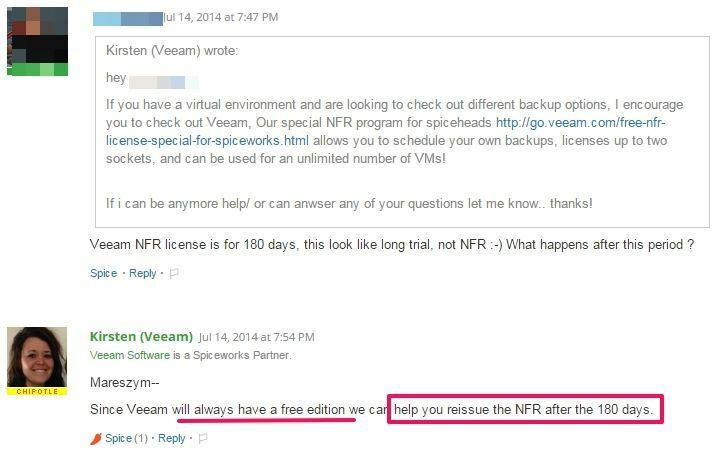 Unlike Veeam, Unitrends has a different position regarding free editions or NFR editions. The good news for Unitrends fans is that it’s still possible to get a free version. In both cases, the best deals can be had if you are part of Spiceworks. You can join the discussion here. If you have experience with free backup solutions for virtual environments, please let me know in the comments. Unitrends Free is great and complete backup solution that includes full/incemental, deduplication, backup copies/replication, html5 unified console, etc up to 1TB … other vendors usually limit the free edition too much like not allowing incremental or scheduling. Consider solutions from open source software like bacula.org or https://www.baculasystems.com/products/bacula-enterprise-plugins/hyper-v-plugin-fast-easy-backup-and-data-restore. It’s free and offers complete Hyper V backup solution. Been looking for a good, light, vsphere backup sollution for ages. Tried all of the mentioned backup solutions. The bigger ones (veeam altaro nakivo trilead) hardly can be used in production environments. At least not for free. They are also quite heavy to use and manage. Ghetto is a bit too bare level for me. Finally came up with XSI backup pro. It is free, allthough paying a small amount for the paid version won’t set you back much, around € 100. It is exellent. It backups all my vm’s every day, sends reports and it always works. No licensing issues, no heavy load on servers. Do try it, you’ll love it. It helped me a lot. VMcom Backup (https://vmcom.com) is now free for non-commercial use. Great for multitenant environments! VSquare Backup (http://www.vsquarebackup.com) has been a long time free backup solution for small businesses. It is also one of the few still fully supporting free VMware hosts backup. How about uranium backup pro?